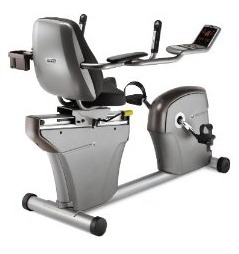 The side console design on the AFG 4.0 AR recumbent exercise bike lets you have an unobstructed view of the room without having to look over the front of the bike. The display has 5 red LED dot matrix screens and an easy to use console. The preset programs include manual, intervals, weight loss, rolling hills, watts, target heart rate, cadence, random, and custom. The AFG 4.0 AR features a heavy 23-lb flywheel and a quiet magnetic brake as part of its FreeSPIN™ technology. This spinning flywheel independent of the pedals allows you to coast smoothly rather than experience joint-jarring stops. Its side-console design is a break from traditional recumbent exercise bike styles. The low height seat and the step-through frame allows for easy entry and exit. The AFG 4.0 AR features a ProFILE™ performance tracking feature on the display, which stores total workout statistics including distance, pace, speed, calories, etc., over the lifetime of the product. Comments from exercise bike reviews focus on the easy of use and the comfortable stable ride. They report good response from AFG when they encountered a problem and compared the AFG 4.0 AR favorable over cheap recumbents they once rode. The extended warranty also played an important part in their choice of an AFG: The bike comes with a 3-year parts and 1-year labor warranty that is automatically extended to a 5-year parts warranty with product registration. 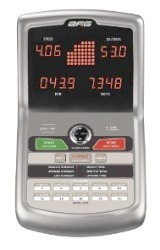 The AFG 4.0 AR recumbent exercise bike is a Good Buy at $1,199. It delivers reliable performance in a near health-club quality ride. If this price is a little too steep for you, take a moment to review the $999 LifeSpan R3 recumbent that has the same size flywheel and warranty. Another recumbent to consider is the Lifecore LC950RBs, which has won several designations as a Best Buy at $1,399.